Xiaomi Mi MIX 3 Leaked Photos Reveal Rear Design - Playfuldroid! All the official and leaked photos of the upcoming Xiaomi Mi MIX 3 smartphone that have surfaced so far have only revealed its front design. A new image of the smartphone has surfaced on Weibo. The image has revealed the rear design of the smartphone and also confirmed its two color variants. 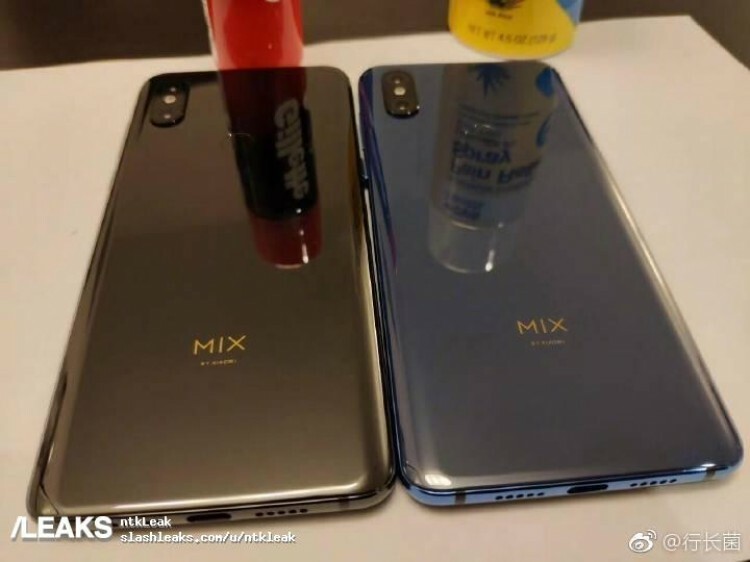 The leaked photo has revealed that Mi MIX 3 features a glass rear which indicates that it will carry support for wireless charging like the predecessor Mi MIX 2S smartphone. The “MIX” logo can be seen towards the bottom portion of the rear panel. The leak reveals the handset in black and dark blue color variants. What’s surprising about this new leak is that it features a rear-mounted fingerprint scanner. This contradicts the recent reports that have claimed that the Mi MIX 3 will be equipped with an in-screen fingerprint scanner. A vertical dual camera is positioned on the top-left corner of the back panel. The bottom edge of the phone features a 3.5mm audio jack, a pair of external speakers and a USB-C port. Xiaomi has confirmed that the Mi MIX 3 that will be coming with a slider design will be featuring an LED equipped dual selfie camera setup. The screen of the phone is expected to support full HD+ resolution of 2340 x 1080 pixels. It will be fueled by Snapdragon 845 chipset. It may come in variants featuring up to 8 GB of RAM and up to 256 GB of inbuilt storage. Xiaomi has also confirmed that it will be the first commercial 5G phone and the first phone in the world with 10 GB of RAM.